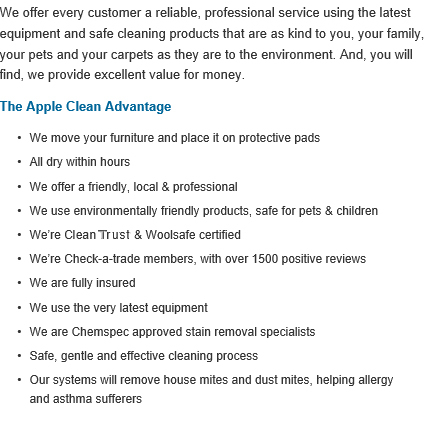 Apple Clean are the Dorking carpet, curtain and upholstery cleaning experts. Local for over 25 years, we provide high-quality carpet, curtain and upholstery cleaning services in Dorking and across Surrey. For professional domestic and commercial stain removal or carpet, upholstery or in-situ curtain cleaning in Dorking, get in touch with Apple Clean for an unbeatable personal service. Hi, I’m Jonathan and for over 25 years I’ve been supplying carpet, curtain and many other cleaning services to homes and businesses in and around Dorking. My beliefs have always been that the best way to success with a local business is to offer an exceptional service which is both professional and personal, giving great customer service and achieving excellent results. Give me a call today and I’ll explain what we can do for you and I’ll give you honest and realistic advice. At the same time you can get an instant no-obligation quote. 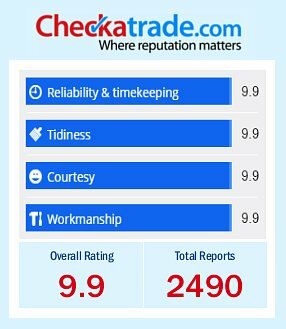 We are very proud members of the Check-a-trade scheme as it enables you to see certified and genuine reviews from past customers in and around Dorking. Give us a call us now on 0800 587 4571 to find out more about the cleaning services we provide to homes across Dorking and how we can help you. Apple Clean provide a wide range of specialist cleaning services to all sorts of client specifications in Dorking and its surrounding areas, whether your property is domestic or commercial. Look no further than Apple Clean when identifying the ideal cleaning company for your furnishings. We are proud to offer the best cleaning services in the area and we have managed to gather a whole host of positive testimonials from past clients in Dorking thanks to our high level of service. Our reputation in Dorking and its surrounding areas proves that we are the number one choice for your specialist fabric, carpet, curtain and furniture cleaning requirements. 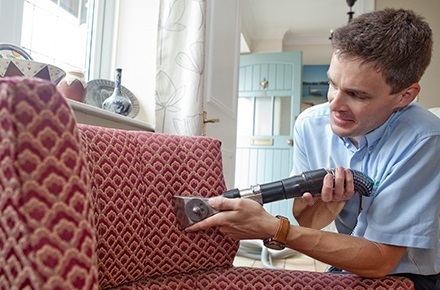 We have dealt with all sorts of fabric cleaning jobs in the past including leather furnishings, stained carpets, upholstery and much more so you can rely on us to provide the services that you require. We are extremely courteous when providing our services to clients and our 25 years of experience has given us the platform that we need to carry out a highly professional job. We work using gentle cleaning techniques whilst making the most of the latest technological breakthroughs in the cleaning industry. Our team of experts are capable of lifting stains from even the most difficult of fabrics such as silk and leather. We also provide an in-situ curtain cleaning service that causes minimal disruption to you and your home, getting the job done practically and efficiently in the process. We are also equipped to prevent your fabrics from staining in the future thanks to our Scotchgard treatment service. This stain prevention solution keeps your furniture looking its best and prevents you from having to receive further stain removal services in the future. We are always keen to build a positive relationship with our clients, which is why you will be met by a polite team of experts once you get in touch with Apple Clean. We take on board all the specific requirements that you have regarding your furnishings, ensuring that your home is in the best shape possible once we’ve left. 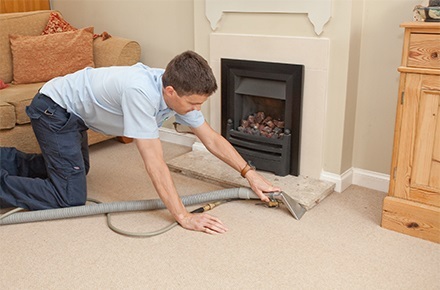 Whether you need potential allergens removed from your commercial property in Dorking or simply an entire clean of your domestic furniture, we specialise in all of these services. Our friendly cleaning specialists are more than happy to tackle any particular task, maintaining the belief that no job is too big or too small. Contact us today to receive a free quotation from Jonathan.